The teaching force is "a leaky bucket, losing hundreds of thousands of teachers each year — the majority of them before retirement age," says a recent report from the Learning Policy Institute. Why are so many teachers leaving? There are, of course, many reasons both personal and professional. Let's start with money. While teachers don't get into the profession for the dough, money is a factor. Beginning teachers make about 20 percent less than college graduates in other fields. But overall, teachers and researchers say, educators want a bigger voice in school policies and plans. Many feel left out of key discussions. "Working conditions are even more important for keeping people in once they've made the choice to teach," says Linda Darling-Hammond, the president of the Learning Policy Institute. Another key factor is preparation. "Teachers who are well prepared leave at more than two times lower rates than teachers who are not fully prepared," Darling-Hammond says. Robert Lutjens 39, is a former middle school science teacher in Sugar Land, Texas, near Houston. "It sounds a little bit dramatic, but part of it was I was not allowed to fail students," he says. "There was a phrase that kept going around that I heard from administrators: 'We need to make sure they succeed, we need to guarantee their success.' Which was code for: 'They need to pass.' "
Lutjens says he just couldn't support passing students if they weren't learning the material. In addition, he says, the paperwork that came with the job was ludicrous, burdensome and plentiful: "I felt that I had a lot of not very effective hoops to jump through." What would have helped him stay? "There's not a simple solution," he says. "I would like to see more of an emphasis on — rather than passing — to have an emphasis on actually learning. The culture of the campus would have had to have a vast overhaul." Lutjens now works as a pastor at St. John's Lutheran Church in Wharton, Texas. Danielle Painton, 34, is a former elementary school teacher from Pennsylvania. When she landed a full-time teaching job right out of college, Painton counted herself lucky. But after a decade at a public elementary school near Lancaster, she called it quits. Education has become test-and-data obsessed, she says: "The schools are being run a little bit more like on a business model of constantly collecting data and then (that's) driving all of our decisions." It's a shift, she says, that eroded emphasis on the craft of teaching and seeing students as individuals. "I can't see that kid who walks through my door — who didn't have breakfast or whose parents just got divorced — and think that his number on his latest test is the most important thing about that child on that day," she told us. Painton remembers a fourth-grade girl who, in the middle of a weeklong bout of testing, put her head down on her desk. "I said, 'Are you OK?' " Painton recalls. "And she said, 'Mrs. Painton, this just isn't fun anymore.' "
"It was haunting me," she says. "I just kept hearing: This isn't fun anymore, this isn't fun anymore. And these are kids." Ross Roberts, 33, is a former high school special education teacher in eastern Tennessee. "Get this," Roberts says. "I was teaching a reading class and I had no books to read!" Roberts spent three years teaching special education in Jonesborough, Tenn., before he decided to leave and become a financial adviser. "If things were different in education, honestly, I would still be there," he says from his office at Northwestern Mutual in Knoxville. A combination of factors led to his departure, but one of the primary reasons, he says, was the frustration of not having essential resources. He says he regularly had to rely on the Internet for reading material. He eventually worked up some grant money and donations to get books for his class. Roberts says it was stressful and annoying that teachers were often expected to pay for major supplies out of their own pockets — on a salary that doesn't allow much wiggle room. "I didn't feel I had that capacity," he says, "and there's a bit of guilt that comes along with that." Administration and leadership also make "a huge difference," Roberts notes. After he left, he says, a new director stepped into his former district who was focused on making sure that technology and materials got into classrooms. "It really all boils down to the level of support that you get," he says. "To have that support coming from the top, it just makes your job easier." Sergio Gonzalez, 29, is a former dual-language middle school teacher in Wisconsin. Gonzalez taught in Madison's first dual-language program — meaning that he taught science and language arts in both Spanish and English to students in grades 6-8. "It was draining but extremely rewarding," he remembers. He'd always wanted to be a teacher. He hadn't even considered another career, he says, until Gov. Scott Walker proposed Act 10 in 2011, a controversial budget measure that was widely perceived as an attack on the power of teachers unions. The act — and the massive demonstrations by teachers that followed — created a toxic political climate and left many educators feeling alienated. "The environment for public education in Wisconsin was changing," Gonzalez says. While most parents were supportive, he says, there was definitely pushback. He remembers that on the day he returned to school, one parent gave him the middle finger as she drove away. "I knew that if I stuck around I was going to get bitter, and I was not going to be a good teacher," he says. "But I can't emphasize enough how, ever since I was a kid, my goal was to be a public school teacher. And that opportunity seemed to be taken away from me." Mayra Linares contributed to this report. Many public school districts say they don't have enough teachers. That's especially true in science, math and special education. A big factor driving the problem is teacher attrition, and it's not just those who are retiring. A lot of teachers are leaving out of frustration and burnout, as NPR's Eric Westervelt reports. ERIC WESTERVELT, BYLINE: Danielle Painton in Lancaster, Pa., is the kind of teacher any district would love to have. By all accounts, she's hardworking, empathetic and committed to the craft of teaching. The 34-year-old got a teaching job right out of college working at an elementary school in a small town near her home in Lancaster, Pa. Painton says she loved the job for 10 years. DANIELLE PAINTON: When I tell people I left teaching, they think, oh, it must be the kids, right? That's what had me there from the start. That's what I miss. WESTERVELT: Painton left, she says, largely because she felt that schools in Pennsylvania had become test and data obsessed. Jump on the big data bandwagon. But no one seems sure, she says, what the bandwagon was really for or where it was headed. The creativity of teaching, she says, was slowly eroded alongside the lens focused on the individuality of each student. PAINTON: You know, I can't see that kid who walks through my door who didn't have breakfast or whose parents just got divorced and think that his number on his latest test is the most important thing about that child on that day. WESTERVELT: The fact is there are many Danielle Painton in America. 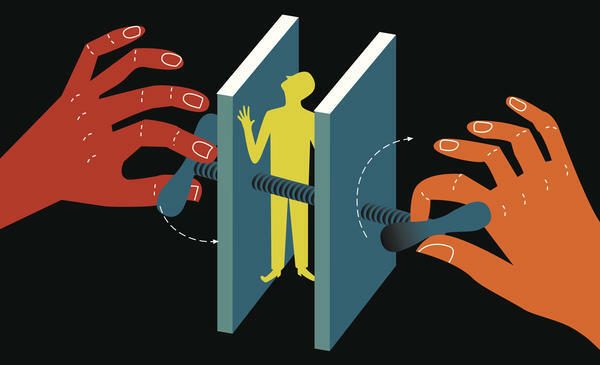 Eight percent of public school teachers leave the job every year, a number far higher than other developed countries where the attrition rate is half that or better. Only a small percentage of that 8 percent is for normal retirement. In fact, research shows that the biggest reason public school teachers bail is not unruly students, ornery parents or low pay. LINDA DARLING-HAMMOND: Working conditions are even more important for keeping people in once they've made the choice to teach. WESTERVELT: That's Linda Darling-Hammond, a leading education researcher and president of the Learning Policy Institute. She says working conditions include feeling that your input is valued, that you're listened to - in essence the vital support teachers need in order to do their jobs well. DARLING-HAMMOND: Which administrators are a key part of providing along with the investments in their teaching conditions and the opportunity to teach freely and creatively in ways that are exciting and work for children. DARLING-HAMMOND: To help solve the problem, Darling-Hammond advocates what she calls the 4 percent solution. Cut the attrition rate in half from 8 percent, and teacher shortages would be largely eliminated. To help retain more teachers, she says, school systems need to invest in revamping teacher preparation, and principals need to invest and prioritize professional development because, she says, all the data show that training and mentoring matter a lot. DARLING-HAMMOND: Teachers who are well-prepared leave at more than two times lower rates than teachers who are not fully prepared. If we could prepare teachers well, mentor them when they come in and give them decent working conditions, we would be very close to the 4 percent solution. WESTERVELT: If not, she says, the problem will continue to impact America's most vulnerable students, as high poverty school districts have some of the biggest attrition and teacher shortage challenges of all. Eric Westervelt, NPR News. Transcript provided by NPR, Copyright NPR.